A photograph of my family — including my children, my parents, an aunt who is like a second mother to me, and my nieces and nephews. It had been a perfect evening by the bay. Everyone was healthy, and we were almost giddy about being together. A photograph taken by my father-in-law of a lone apple tree which stands on their windswept property in upstate NY. I love this gnarled tree. The trunk is absolutely hollow, yet it supports the most incredible foliage and fruit season after season. The photo represents a profound appreciation of nature, as well as resilience and abundance. A small clay Buddha made by one of my sons while we were on a family retreat at the Insight Meditation Society. It symbolizes the gifts of contemplation, compassion and community that I’ve found through studying mindfulness. 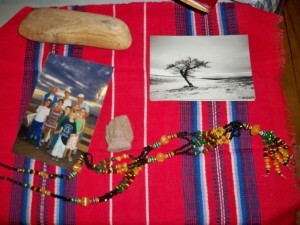 A necklace made by desert women in North Africa. It was given to me by a human rights activist I worked with who became a true friend. A year ago she nearly died on a hunger strike, and I learned much about what it means to take a stand for what you believe in. The necklace represents my work, which is fulfilling and gratifying (most of the time!) because of people like her. On the evening of our class, we set up our small altars side by side. I was blown away by the power of what everyone brought: photos, baby clothing, journals, sheets of music, cherished jewelry, an onion, a note from a lover before she died. All of it symbolizing the significance of our lives and the broader web that links us with the people and places around us. Then came the twist. . . we were going to do a walking meditation around all of the altars, and each time we walked around we were to take one of someone else’s objects and put it under a cloth on the adjacent table. Wait – did I hear that right? We were going to take one of these life treasures away from someone? And others were going to take away mine? Yes – that was the exercise. I wasn’t sure I was going to make it through. The objects themselves I can live without. But what they represent, I cannot. If the very idea of the exercise was that painful to me, how could I inflict it on others by gathering up their things? So we began the walking. And the taking. And the being taken from. First the photograph of the apple tree vanished. On the next rotation, the drift wood was gone, then the necklace, then the Buddha. I also picked up objects from others and placed them as carefully as I could under the cloth. I could hear some of my classmates quieting tears. Mainly, I was focused on the photo of my family. I nearly pleaded, “OK – I get the point. Let’s just stop the whole thing here.” In the next rotation, the picture of my family was gone. Then the very cloth that represented the altar was gone. I was gone. There may be an element of ‘you just had to be there’ to this. But I can tell you that the experience felt like death itself. It shook me to my core, revealed all of my attachments, and demonstrated viscerally the lesson of impermanence. Up until that moment, I thought I was handling all of this study of death pretty well. Now I see that I had been holding it at arm’s length, dealing with it intellectually and in words. There’s been much for me to reflect on as a result of that class, and the lessons don’t come easily to conclusion. But in the meditation that immediately followed the disappearance of our altars, I felt inexplicably hopeful and light. It was as if a source of great worry had been lifted. I wasn’t at all sure what it meant, but it seemed like a net good and I’m going to go with that. Wow! What an incredibly intense exercise. Your teacher really knew how to get you to the next level, huh? I’ll be thinking about this for a while. Thanks for sharing. Five!? You want only five!? Wow. You’re right. This is a difficult exercise. As I sit here looking around my office, the little altar on my desk, and then ponder mementos set out about the house, I freeze at the thought. I’m still thinking. Your post raised a couple of interesting questions that I should spend some time thinking about. Very informative, thank you. Hmmmmmmmm, 5 things. I have moved a lot so have been through this process of late of letting go of a lot of my stuff. 1) a tiny statue of a dancer my brother made me as it represents the freedom, my inner essence that I still seek, but am convinced he sees. I thought I lost it once & wept I was so upset. 2) a photo of my dog because well, I love that dog! 3) a picture of the Dalai Llama that sits on my altar because everytime I see his smiling face my heart fills & I am reminded of non-judgement toward others and myself. 4) A lapis piece I got in Greece that looks like the world. It rests on three dolphins. And, reminds me of my first int’l trip & how it expanded my horizons. I traveled every after that. Also we saw three dolphins jumping in the air that trip – it was magical. 5) Don’t know if this is cheating, but maybe I will do this. Make a composite photo of my closet friends because in my life, it has been my friends who have got me through. My friend who is a professional organizer is coming to stay next month, and I have to say I’m so nervous about uncovering even more things that I’m attached to! Still, it’s an amazing exercise to try out. Dear Barbara, What a powerful posting. I felt the visceral loss in my own belly. This process of “what five things” is connected to so much more than the “stuff” but the sense of meaning and letting go even of meaning. Ultimately, it’s the ability to not only let go of the stuff but the sense of meaning that those items engender. It’s at the deepest level, letting go. Wow! What a powerful post. You brought serious tears to my eyes. Wow. That shook me to the core. Deep stuff. I am losing my hearing, and the things I will miss the most, are the voices of my children. When my mom died, it was her beautiful voice that I missed the most. I imagine the same would be true for those going blind. Thank you for your post. All the rest of the stuff, is just that, stuff. But what it represents, will always stay with you. Great post. Thank you for your post and for your own honest blog. When I was in school, our beloved music teacher began to lose his hearing. I think about him whenever I hear a moving piece of music. One of my son’s favorite books is about a boy who is deaf but “listens” to music through the vibrations of a balloon he holds in his hands during a concert. It reminds me of how resilient people can be, and I hope my music teacher was similarly able to find some form of his own acceptance and enjoyment. Is This Really Your Last Year?